I wrote an article on this subject on June 3rd 2018. Many studies have been made recently only to discover if you don’t have a healthy gut you probably do not have a great immune system and suffer from many different ailments. It affects your brain, hormones, joint pain etc and has a great influence on depression, sleep, being over weight and other chronic problems. There are a number of articles on this subject which we never really considered until now. Those little micro organisms in your stomach are very important and need to be introduced to our gut on a regular basis. Good sugar free yogurt, fermented food, good water (Kangen water ) are all beneficial to the gut. If your life is in the fast lane then getting the essentials for your gut is near impossible. I have been introduced to a product that has done years of research on this subject and come up with a great product which I believe to be untouchable by other products. I kid you not. If you are wanting quality of life then you have to look at this and consider giving it a go. It is one of Isagenix products and if you want to find out more about them go to the Isagenix sites below. This is so true. 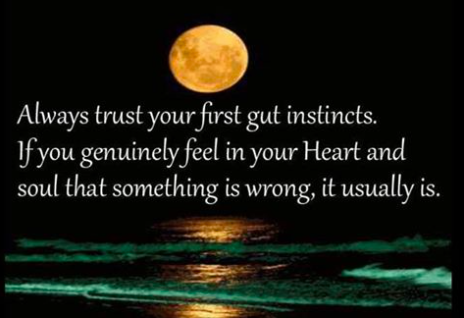 Animals always rely on their gut instincts when they are in a position of danger. We as humans not so much. We don’t listen to our inner warnings often till its too late. Wether it be someone you meet, business decision, danger, survival.